This morning at the Opening Ceremonies of the Vermont Business & Industry EXPO, organized by the Vermont Chamber of Commerce, Governor Jim Douglas presented the highly anticipated Deane C Davis Outstanding Vermont Business of the Year Award to BioTek Instruments, Inc of Winooski. 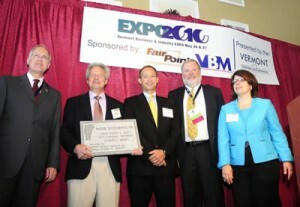 BioTek is the 20th winner of this annual award that was conceived by Vermont Business Magazine and the Chamber in 1990. BioTek is a Founding Sponsor and active member of the Vermont Biosciences Alliance.